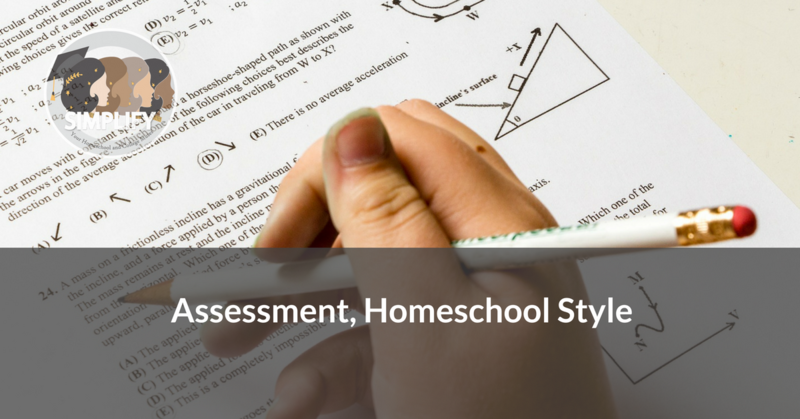 Assessment is one of those big, scary topics, even for a lot of seasoned homeschoolers. It can also be a lightning rod since the constant barrage of standardized testing is one of the factors leading some families to choose homeschooling in the first place. Still, I’d like to argue that there’s nothing wrong with assessment and that it doesn’t need to be an intimidating topic. Assessment, when done well, doesn’t have to be intrusive or limit learning. You don’t have to teach to the test to be assessing. You don’t even have to use traditional tests at all, though you can. Assessment should put your mind at ease and help you be a better teacher for your student, finding their strengths and weaknesses, seeing what’s working and what isn’t. Below are some of the options for various kinds of assessment in your homeschool. Most of us are assessing our kids constantly without even realizing it. Don’t underestimate the power of this type of assessment. In a homeschool, where one on one interactions are common, the homeschool parent is usually able to assess much more efficiently and quickly than in a school where there’s a gap between giving an assignment and seeing the results. We often step in and stop our kids if they’re getting everything wrong on a math assignment. That’s assessment. We watch our kids as they write or prepare presentations or begin projects and we step in and scaffold for them when they need it or to assess where they are. It may not be a grade, but that type of assessment is essential and usually the most important assessment we do on an everyday basis. One simple way to assess what your child is learning is to keep lists of things your child does. A list of books she read is an assessment. It shows her reading level and how she progressed over time. Keep lists of read alouds, field trips, questions your child asks, topics you covered, types of assignments you gave, or anything that seems to show how your child progresses over the course of the year. One simple but powerful assessment tool is to do the same thing twice or even periodically over the course of the year. For younger students, reading or copying the same passage can show how reading and handwriting have advanced. You can record your student reading aloud, which is a powerful way to remember just how he sounded, or you can time how long it took to read a passage or how many words he stumbled over. For older students, doing the same math test or writing a short paper on the same topic can help you see how your student made progress. Classroom teachers do this all the time, but for whatever reason, homeschoolers often seem reticent to make their own tests. Your test is just as valid as the test that comes with a curriculum or textbook. It can even be better because it specifically tests the things you wanted your student to remember. Because you’re assessing your student one on one, you can also make your test oral or make it include a practical demonstration or be tailored to how your student best demonstrates their learning. It doesn’t have to feel like a test at all if you don’t want it to and you definitely don’t have to learn to write multiple choice questions. Make the test you know will really assess whether or not your student learned what you set out to teach. Most homeschoolers don’t use grades in the early years. However, grades are a necessity for most college-bound high schoolers and there may be times that you want to use grades. Rubrics are specific expectations for an assignment that make it clear which assignments will receive which grades. Remember that you, as the teacher, can decide the formula for calculating grades and the specific expectations on a rubric or other grading tools. If you want to consider “tests” for the entire grade, you can. If you want to include a grade for effort or consider daily assignments equal to quizzes, you can do that. There are a million ways to grade and you should feel empowered to set the standards you feel are appropriate for your situation. This method is most common in math, where students can get overly accustomed to the phrasing their specific textbook uses. To see if a student is really understanding the material, find a test from another textbook to use. You can also use placement tests, which are generally available online for free, from other programs. This is a great way to step back and see how a student is doing through another lens. One way to avoid doing busy work is to use assessment as a way to accelerate a student. Instead of testing at the end, think about testing at the beginning of a topic. Find out what your student knows before you dive in. That way you can skip over skills they’ve already mastered and tailor your curriculum to the things they still need to learn. One of the best ways to assess is to keep samples of your student’s work over the course of the year. This is often referred to as “portfolio assessment” and it’s used in schools too. Choose samples of the best work or of random work and keep them in chronological order or date them. One way to make sure you’re doing this is to set reminders or have a special day once a month or so for collecting a few samples. This is one of the best ways to assess as students get older because it gives them a role in their own learning. A self-assessment can be as simple as a short writing by your student saying what they learned and how they think they’re doing overall. You can give them guiding questions as they write and remind them of topics you studied or major projects they did. Goal setting is similar. The student writes out their own goals for school, such as to master a particular skill or complete a particular type of assignment. They periodically check in to say whether or not they met their goals. If you use portfolio assessment, these documents can fit into the portfolio alongside sample work and lists. If you use a student planner, you can set aside a page for goal setting, such as the notes section on your month pages. Free assessments can be found online and are especially useful for early reading instruction, though you can find them for spelling and math skills as well. The Miller test and the free test on the National Right to Read’s page are two good options, but there are others. Free tools aren’t as comprehensive as some of the paid standardized tests, but they can give you a rough sense of where your student is. Standardized testing often has a bad name among homeschoolers. Unless your state requires it, you really don’t need to give standardized tests, especially if you’re comfortable with how your students are performing. However, giving a standardized test at home is a very different experience from the lengthy batteries of sometimes poorly written tests that students often go through at school. You can choose the test that’s right for your child, spend a minimum amount of time preparing for it, and make sure it’s a positive experience, or at least a neutral one by giving it at the optimal time or day or providing a special treat afterward. There are multiple standardized test options out there. The ITBS, or Iowa test, is a good general test to consider, but there are many others, some with online versions and others that use old-fashioned bubble sheets. Seton and Brewer are two companies that offer nationally normed standardized tests for homeschoolers, but there are many others. When you get the results, remember that you’re looking at where your student ranks, not how many questions they got right. If you suspect that your child has more serious issues or see from your assessments and from observing their peers that they’re not progressing, then it may be time to consider hiring a professional. You want to find a psychologist who can diagnose learning disabilities and administer a battery of educational tests that only psychologists are qualified to administer and interpret. Sometimes insurance will pay for this and your pediatrician is a good place to ask for recommendations. Remember that classroom teachers use professionals to see if there are learning issues with students too. If you suspect an issue like dyslexia or ADHD, having that diagnosis will be necessary to receive special accommodations on testing, including college entrance exams like the SAT, or in the classroom should your student ever return to school. It should also help put your mind at ease and put you in touch with the specific resources for a student with learning differences. Next StoryAre You Still a Homeschooler if You Outsource?